Brandon Weeden probably doesn't want to hear about a burger that has been named after him at a restaurant in Ohio. 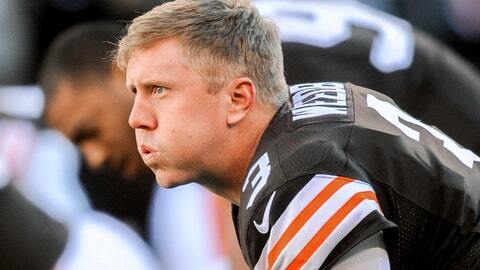 Brandon Weeden isn’t popular in Cleveland right now. Sure, he threw for 370 yards on Sunday. But the Browns lost and he threw three interceptions. Making things worse, they lost to the Jaguars, which is never a good thing. We reached out to the restaurant on Tuesday and got some details from the owner, Nate Rockwell, who came up with the idea. The first question: Will they actually sell this burger on Sunday? "If they pay for it in advance I’ll be happy to to do it," he said with a laugh. "But I’m not sure how they’ll feel picking it up off the floor." "Just general frustration over the level of play by Weeden," he said. "His level of inconsistency ever since getting here." "Year after year we’ve been waiting for that special moment when the team is in first place for more than two games," he said. Rockwell said his restaurant only offers burger specials on Sundays. The rest of the time they sell southern BBQ. He says most burgers cost between $8-$12, but he’s willing to work with a customer on the price of this week’s special. "We can give a small discount, an employee discount, for someone who wants to play along with it," he said with a laugh. Rockwell added that it’s all in fun and that he just wants to see the Browns do well.